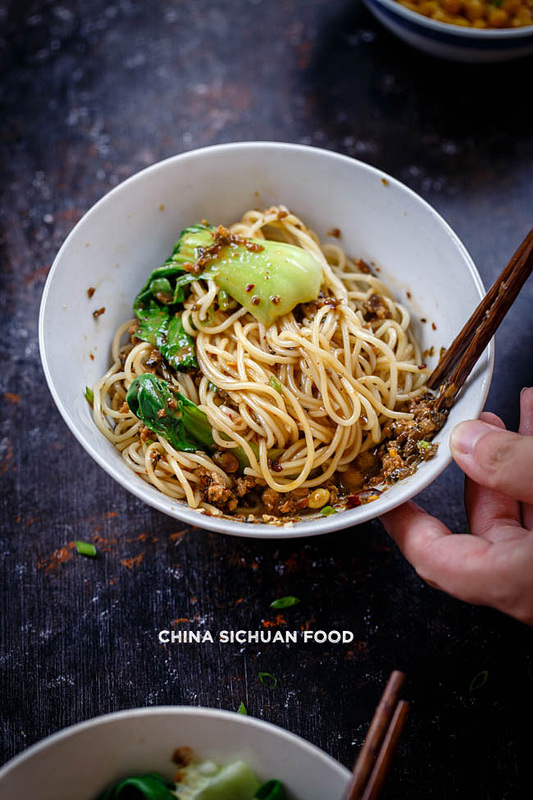 Famous Szechuan style Dan dan noodles (担担面) is one of the most popular Chinese street foods. To me, it is one of the top Chinese noodles. But it is quite hard to define an authentic dan dan noodles. In Sichuan, it is crispy, spicy and numbing (caused by Sichuan peppercorns), with lots of variations in different restaurants. However, in other Sichuan restaurants outside this area, it might be crispy, slightly spicy and sweet. 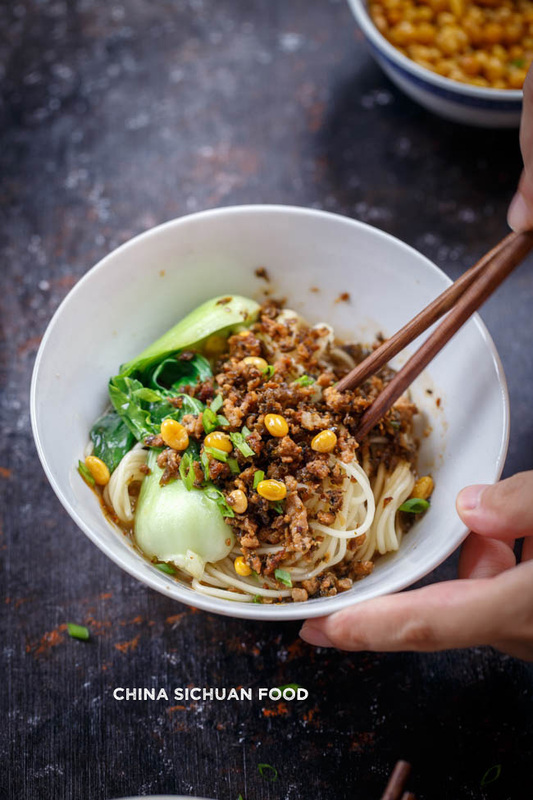 So I am not brave enough to call this an authentic dan dan noodle recipe, but it is the easiest way to put together a yummy and satisfying dan dan noodles. Dandan in the name actually refers to a carrying pole(扁担 in Chinese ). In the past, the vendors carried the noodles and the sauces to sell them on the street. When you order one bowl of dan dan noodles, the vender mix the noodle with the pre-pared sauce and top with the pork topping. With this traditioinal method, the authentic dan dan noodle cannot be soupy. With the traditional method, we serve dan dan noodles with fried soy beans or peas. They present the highest level of crispness. Usually we fry a larger batch each time. You can simply mix the remaining with salt and sugar, serving just as a snack. If you do not want to brother for frying, when you use crushed toast peanuts. Ya-cai(芽菜) is one of the three most important and famous preserved vegetables in Sichuan cuisine. The other two are pickled zha cai and black salted turnip. 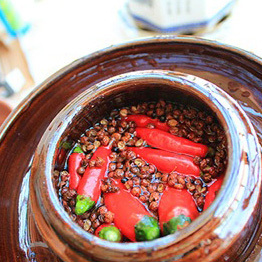 Making different types of pickled and preserved vegetables is one of the daily cooking tasks of housewives in Sichuan province. Traditionally, we will have a large jar for keeping this unique ingredient. However, we use packaged version for daily cooking now. Sichuan red oil (四川红油) makes the noodle spicy and slightly numbing. Even if you cannot handle spicy food, at least 1/2 tablespoon of Sichuan red oil should be used in the mixed seasoning to compete the flavor. By the way, the red oil should be prepared at least 24 hours ago, so the capsaicin and red color can be well mixed with the oil. How to serve dan dan noodles? Please do not use large raman noodle bowls to serve dan dan noodles. Choose smaller ones and serve with a small amount of soup base (chicken stock or pork stock), so the noodles can be eaten up within minutes. Enjoy when it is still hot and the pork is still crisp. It should be slightly soupy before mixing. Pre-soak dried soybeans until they are double in size. Transfer out and drain with kitchen towel. 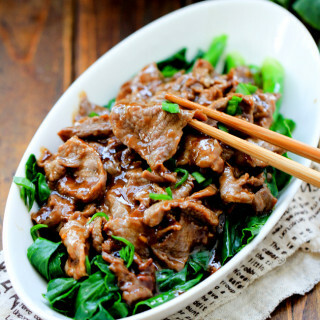 Mix the minced pork with a small pinch of salt, white pepper and 1/2 tablespoon of light soy sauce. 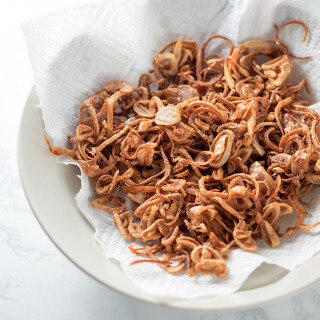 Heat up around 1 tablespoon of cooking oil in wok, fry garlic and ginger until aromatic and then fry minced pork until crisp. Then add 1 teaspoon of dark soy sauce for better coloring, Move the pork to the out round of the wok, add another 1 tablespoon of oil in the bottom add ya-cai, separate ya-cai quickly and mix them with the pork. Add around chili powder (optional) and mix well. Transfer out and we are done with the pork topping. Mix all the seasonings for serving and divide into two portions, separately in two serving bowls. Pour around 1/2 cup of hot pork stock. Cook noodles in boiling water according to the instructions on the package and blanch vegetables in the last minutes when the noodles are almost ready. Transfer the noodles to the serving bowl. Top with pork topping and then pour around 1/2 cup hot pork stock or chicken stock along with the edges. Add green beans and fried soy beans. Serve immediately! If you want a real Sichuan version, you can sprinkle some fresh grounded Sichuan peppercorn. 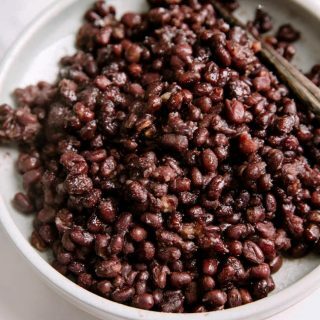 You can skip the chili powder and add 1 teaspoon of Chinese five spice powder to milden your topping. Do you know how to make the la mian dough (hand-pulled) ? It is something that I can’t find on internet… Perhaps you can help me ? Cheers & happy new year by the way! Making la mian dough is not easy. I am so sorry that I cannot help right now. 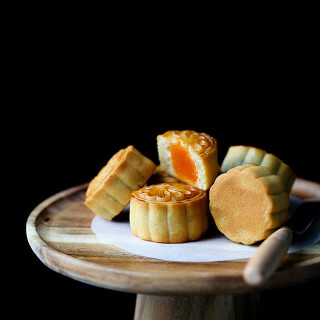 In China, the cooks add peng gray named as 蓬灰 to increase tenacity. And the skills of pull the la mian need long practice. To tell the truth, I do not want the peng gray used in my kitchen. But you can hand-pulled homemade noodles at home. I will try to come up with a hand-pulled noodle recipe if that’s also acceptable for you. Thank you Elaine for the hint to this food additive. Now I know I will never be able to pull the noodles like they do in the Youtube videos. I sometimes make fresh noodles every day : mix wheat flour with water and some salt (3-5%) and knead it thoroughly for at least 10 minutes. Punch the dough really hard from time to time; I even throw it with full force onto the kitchen table. You’ll get a dough that’s elastic. If you take the dough by one end and beat it onto the table, it should still stay in one piece. Cover with transparent foil and let rest for an hour. Repeat the kneading and punching process, then make elliptical balls of about 40 grams each. Brush some sesame oil on each ball, cover them for an hour. To finish, roll out in the shape of a fish (means, long, not wide or square). Make three or four cuts into the dough, but not all the way through. Then take the ‘fish’ in both hands and pull. Boil immediately in chicken soup, for instance. Enjoy! That’s a great way. We have a similar noodle dish in China named as 浆水鱼鱼. It is shaped as fish too. 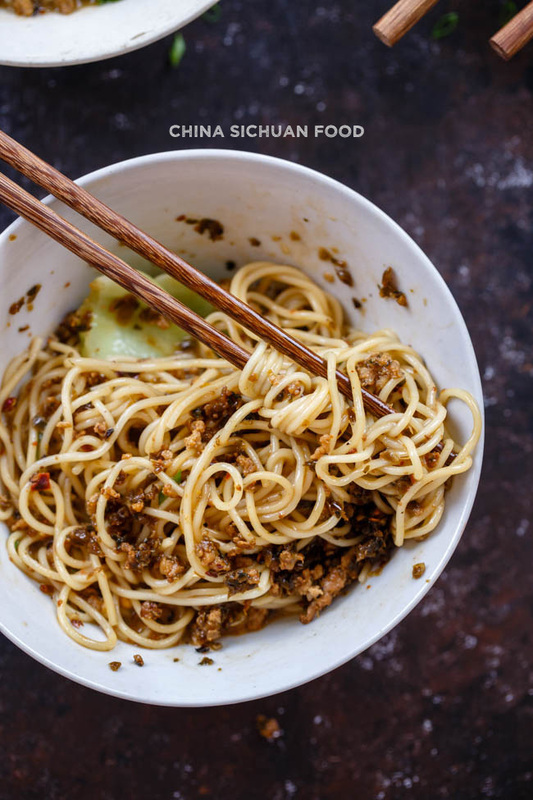 It is much easier and quicker then normal hand-pulled noodles. But believe that making hand-pulled noodles is not as difficult as imagine. Two or three times of practices can improve the skills greatly. Ha Ok…I also don’t like chemical things i my kitchen either…This is a good reaction. I showed my daughter this recipe and we are very excited to try it. I have to figure out where to buy the pickled vegetables…..
That’s really great if you can buy the pickled vegetables. Come and try. I would love to hear your feedback. Just made this for lunch for myself, the wife and the twins. Very tasty and everyone liked it! First recipe I have tried from here and I couldn’t find Zhai cai or ya cai. Also didn’t have chicken stock but still was nice. Thanks very much for a lovely recipe! I’ll be sure to try more in future. Thanks for the lovely feedback. I am so glad your family love it too. i like to said where i find out a pikkle vegetables, kindly let me know. You can try to get some from larger Asian stores or try to search online. Thanks Nami. Dan Dan Noodles with some chicken soup is my favorite noodle dish. Go ahead and enjoy with your family. I am a big fan of Sichuan Cuisine. Looks like your 2013 version of Dan Dan noodles had less oil but in this latest recipe picture I can see a lot of oil or is it chicken broth? Also I always choose wrong noodles because there are so many options in store. So can you share online link (from amazon) for noodles that you use for Dan Dan noodles? The oily looking is coming from the chicken broth with the red oil floating on the surface, as I have not mixed them before shooting. I slightly add more chicken broth in the new version for a more moist texture. 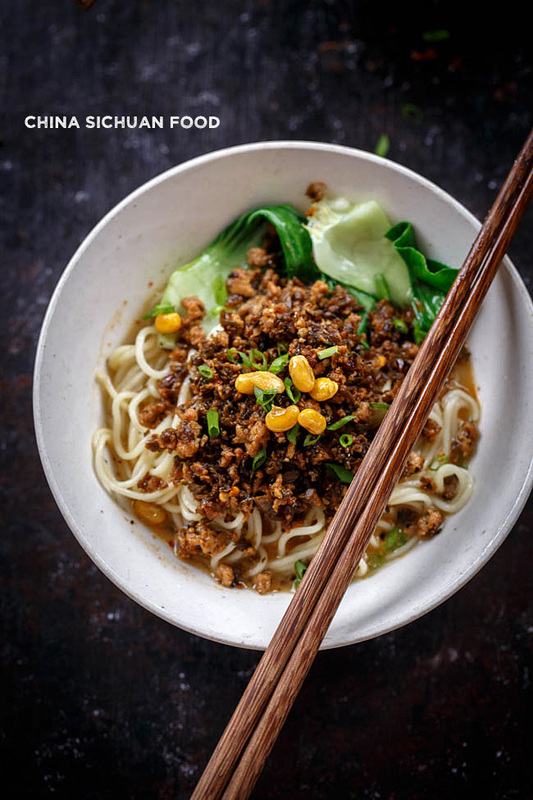 As for the noodles, we have a special noodle for dan dan noodles, but I failed to find it on amazon.We are using thin and round fresh alkaline noodles for an authentic Szechuan style dan dan noodles. You can choose thin and round egg noodles to replace it. I tried the Dan Dan noodles following your recipe and it turned out great. 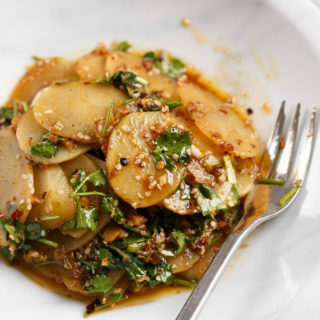 I was trying to find a Sichuan garlic sauce recipe similar to below link. I would be great if you can share a Sichuan version on spicy garlic sauce. Also I couldn’t find contact us page where I can submit my requests so I am using this space for requesting a Sichuan Garlic Sauce recipe. 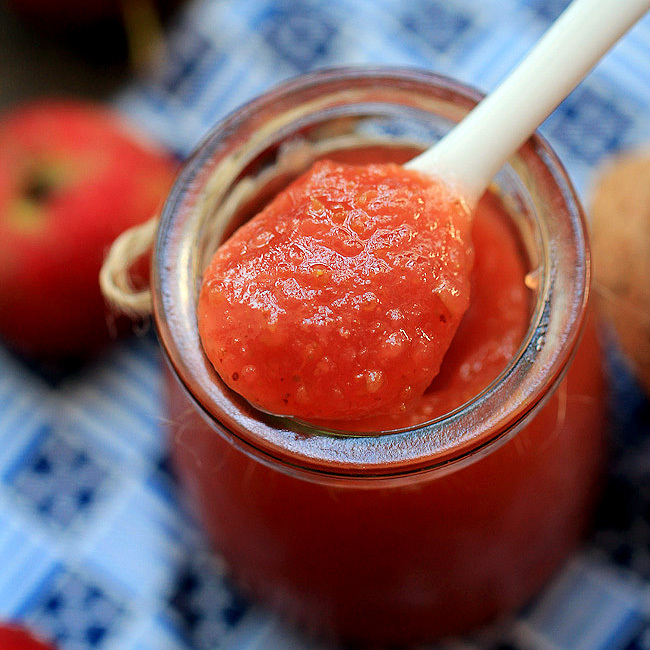 This spicy garlic sauce is known as fish fragrance sauce. You can refer to this https://chinasichuanfood.com/yu-xiang-qie-zi-sichuan-eggplant/ and there is a stir fry sauce in the recipe. Adding garlic, ginger and green onions into the stir fry sauce to make ready to go fish fragrance sauce. It is really yummy! I really enjoy your website. Are the use of soybeans (or peanuts) a new style for Dandan in Chengdu? I did not see that variation when I was there. I came on the site today because I am making dandan tonight and wanted to print out your recipe. I am excited to try the new one. The fried soybeans or peanuts added in fact gives the noodles a crispy taste. It is not necessary but quite helpful to highlight the noodles, just like used in other Chinese noodles. Happy cooking ahead and wish you enjoy it. This recipe was delicious. It is my new standard! Thanks David for the lovely feedback. I am so glad that you love my favorite version too. Hi, I love Dan Dan Noodles, I was just wondering why don’t you use sichuan pepercorn in your recipe? 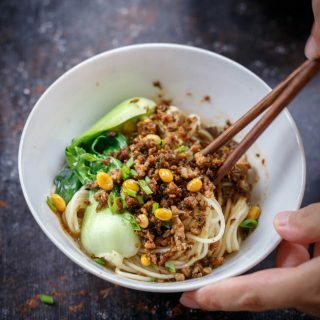 Isn’t it really important to get the unique “ma” flavour of the sichuan province? Good question. 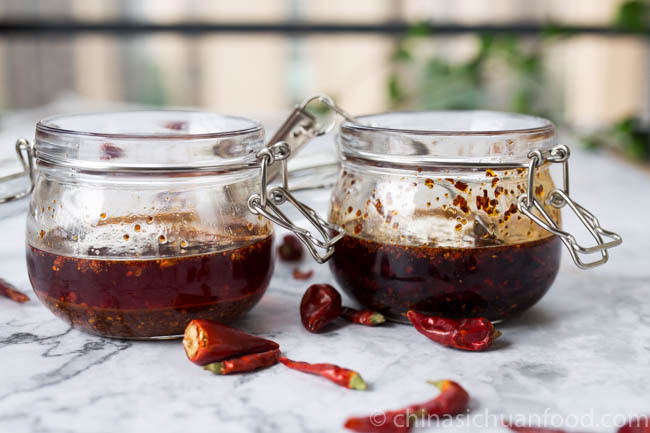 In fact, the homemade chili oil contains sichuan peppercorn. 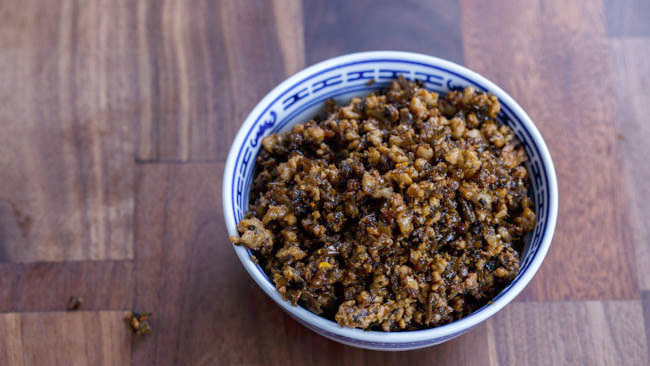 If you like a stronger Ma taste, add some powder or whole sichuan peppercorn to the pork topping. Do you have a recipe off egg noddles? 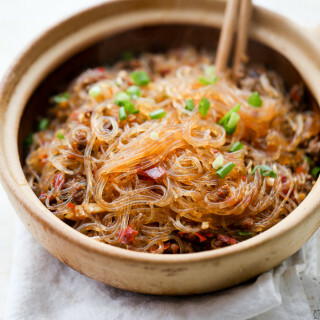 You can use replace with eggless noodles. But choose slightly thinker ones than thin noodles. Is this any similar to Xiao Mian noodles? If not, can you also provide the recipe for that? Chongqing Xiao Main has been my favorite noodle dish for years. This one is similar but not the same. I will try to make that version online as soon as possible. Hi. Good recipe. What do you mean by ‘chili powder’? Can you give an example? Thanks. It is ground chili pepper. But the second time was better, it was this recipe – https://labelledamesanssouci.wordpress.com/2016/12/14/fuchsia-dunlops-xie-laobans-dan-dan-mian/ – this is the one I usually cook now. I will try yours too, because it looks delicious. I am researching and getting ingredients together to make this dish. I like to make my own pickled vegetables and so I would like to make my own Ya-Cai. Is there a mustard green variety from the USA that would be comparable to the Sichuan version? 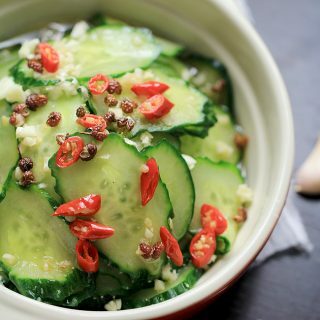 Is there any particular brine ingredients I should use for pickling? Ya-cai is made from upper stems of mustard green. 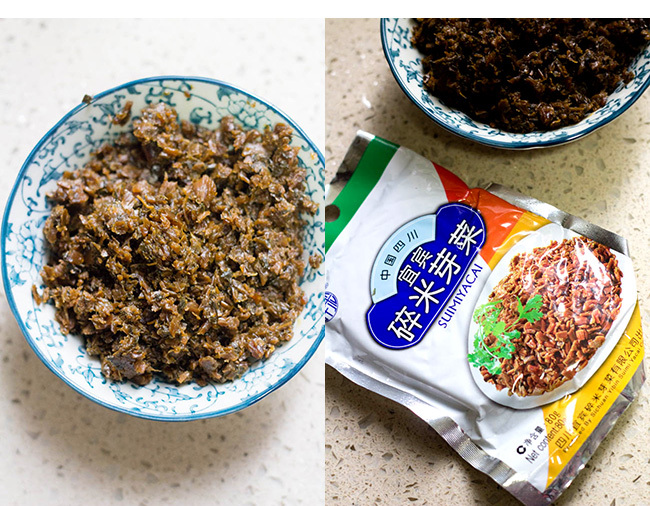 So it might be difficult to replace Sichuan style Ya-cai at home. Kitazawa Seeds offers a variety of asian mustard greens including those traditionally used to make yacai and zhacai if you want to make your own pickled greens/stems/roots. Of course, also delicious as fresh greens.